Watercress is in the Brassicaceae (mustard) family and like wild mustards, this sought-after aquatic plant has a pungent, yet desirable peppery taste. 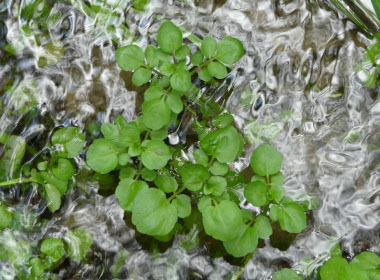 Watercress has likely been gathered as food for hundreds of years. This perennial plant was introduced to the Western Hemisphere by European settlers, who used it as an antiscorbutic, to counteract scurvy. 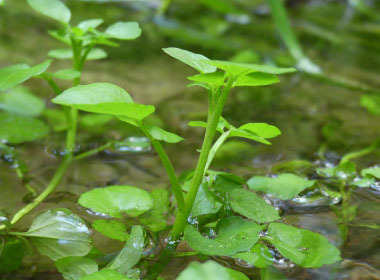 It is believed that this aquatic plant was cultivated in sixteenth century Germany. Watercress is (possibly) considered invasive in parts of the U.S., Puerto Rico, southern Canada, Sub-Saharan Africa, parts of South America, Australia, and parts of tropical Asia. 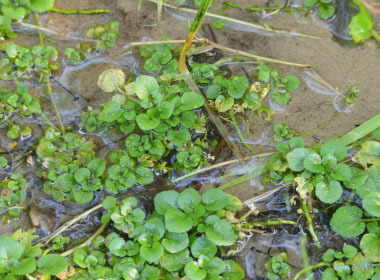 Distinguishing Features: Watercress forms a carpet of small round leaves. White flowers appear above the water from March through October. 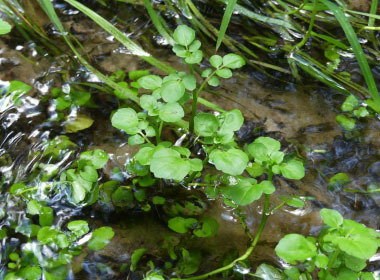 Watercress grows in shallow running water so it is easy to find. 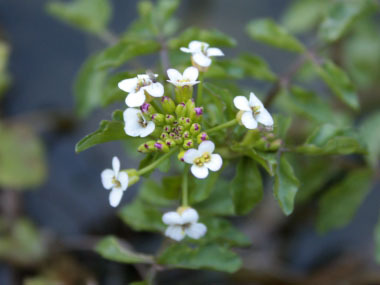 Its flowers are small and white and occur in long clusters like other mustards. Watercress is a glossy-looking, mostly hairless, medium-sized, aquatic or sub-aquatic plant. The stems are hollow and almost circular-shaped with ridges. Numerous rooting hairs are found just below the waterline. Water-loving plants adapted to submerged life contain large air-filled cells; a similar tactic to estuary plants. Flowers: White flowers appear above the water from March through October; but at the more northern latitudes it is usually May to July in most locations. Southern hemisphere flowering times are different. It’s inflorescence will be a typical brassica display, appearing at first like a small broccoli-type head. Soon after budding it will reveal numerous small white flowers, approximately 10 mm across; each petal measure 3 to 5 mm long. The four petals, like all cruciferous plants, are arranged in the shape of a cross. Flowers give way to long thin seed pods, similar to numerous other related species. Fields of Nutrition has medicinal benefits and vitamin/mineral content of Watercress. Leaves: It has alternate, compound-pinnate leaves. Leaves measure 4 to 16 cm (1.6 to 6.3") long, 2 to 5 cm wide, dissected into 3 to 11 lobed and usually rounded dark green leaflets. Upper leaves nearly rounded. 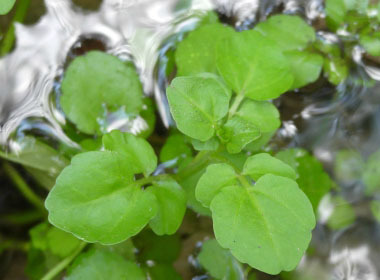 Height: Watercress can grow to about 30cm (1') in height. Stems are hollow. Habitat: Common along stream margins, river edges, ditches, and other shallow areas with cold, slow-flowing water. Its native range is Northern Africa, Europe, temperate Asia, and India. It is now found in many countries worldwide. Edible parts: Leaves taste bright, fresh, and peppery. Leaves and stems contain high quantities of vitamins (especially vitamins C and K), minerals and Omega-3. Seeds and flowers are also edible. Be sure to harvest from clean sources of water if you want to consume this raw in salads or in sandwiches. Any plant that grows in water that drains from fields where livestock graze should NEVER be consumed raw – it MUST be cooked. Watercress growing in these locations is prone to infestation by the cyst stage of a parasite (Fasciola hepatica). If consumed raw, you are at risk of these hatching into liver flukes inside you. Cooking destroys the parasite. Other name: Two rowed watercress. 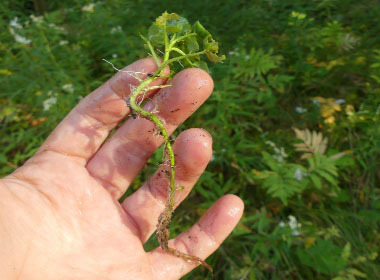 Similar plants: One Rowed watercress.